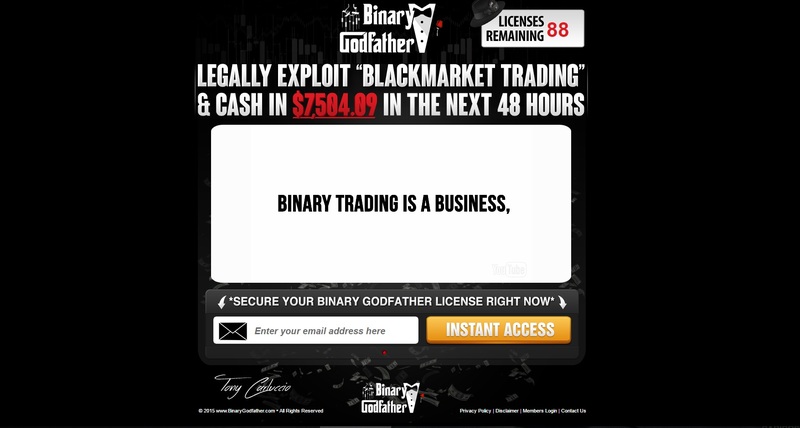 Carluccio says that Binary Godfather is a black market method for trading binary options that can make you more than $7,000 in the next 48 hours. It is because Carluccio allegedly have friends that give him inside information about commodities. And guess what, you can get this allegedly illegal trading system for free and become rich. Carluccio’s story is a fairy tale and Binary Godfather is a scam. In fact, Carluccio does not even exist, it is a fictitious character created by scammers. This program is made to make money to scammers and to lose yours. We can easily prove that Binary Godfather is a scam. The proof is the software that you will be given access to. It is supposed to be a unique app developed by Carluccio, but it is a well-known white label software used by many scams. Look at the picture to see some other scams that use the exact same software, like Swiss Binary Robot, Cognitrader or Hexa Trader. Scammers just change colors and logos, the app remains the same. And we know from real users of this software that it is losing money in trading! Now you might be surprised that somebody is giving away for free a losing trading program. Why is that? It is because scammers are associated with some brokers and get paid for referring new depositors to these brokers. So the whole Binary Godfather story and software are just tools to make you deposit money with a certain broker, so that scammers earn their affiliate commission. If you do it and let the software trade with your money, you will lose it. Simple as that. Binary Godfather is a very basic scam that will push you to deposit money and then it will lose your money. So stay away from it! If you are interested in the simple concept of binary options, try a free demo account with a regulated broker to see if you are able to learn to trade profitably. Train on the demo until you become profitable, only then you can start trading with real money.